Hi, everyone! Hope your week is going swimmingly! I'm still in shock that I'm no longer on vacation -_- I'm pretty positive that it's not okay to ever have to return to work after vacation. To make myself feel better, I painted my nails! 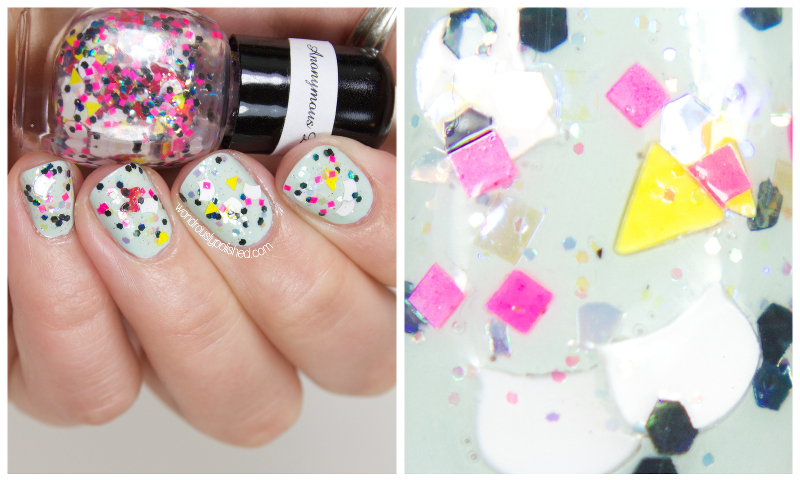 Go figure ;) Today I've got the very first collection from a new indie brand, Anonymous Lacquers. I've got swatches of the Like a Virgin collection (inspired by 80's music icons) as well as an added bonus polish to share so let's get to it! 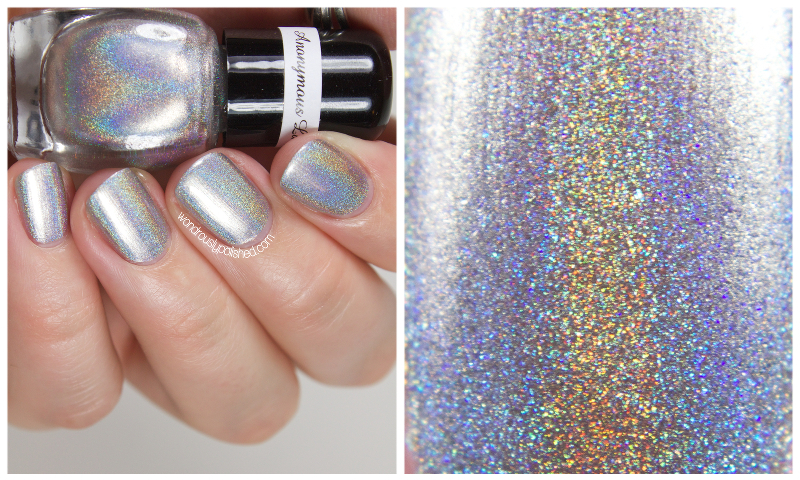 Moon Walking is an chrome linear holo and is really lovely, definitely a great homage to Michael Jackson's music (and his white glove, perhaps?). 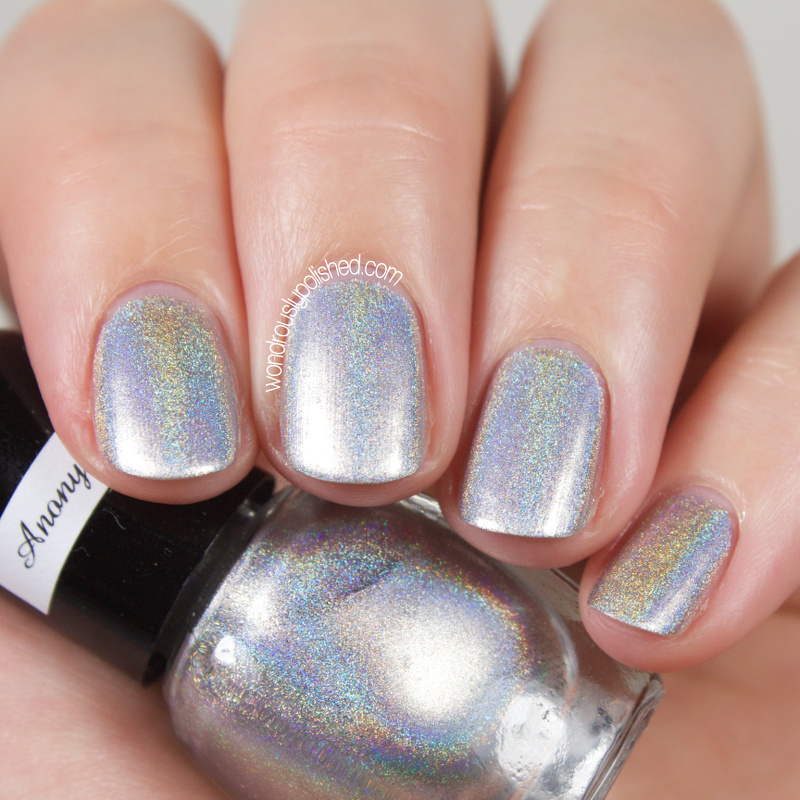 This is quite a lovely holo and if you love silver polish and holos, this is for you. The formula is great and the application was breezy. One thing to note, because it's metallic, it does leave some brush strokes in the finished look. However, I feel that the holo overpowers makes up for the brush strokes so it's not an issue to me. Shown is 2-3 coats. For the Prince fans out there, you might have guessed that Purple Rain-bows is inspired by the artist formerly known as Prince. 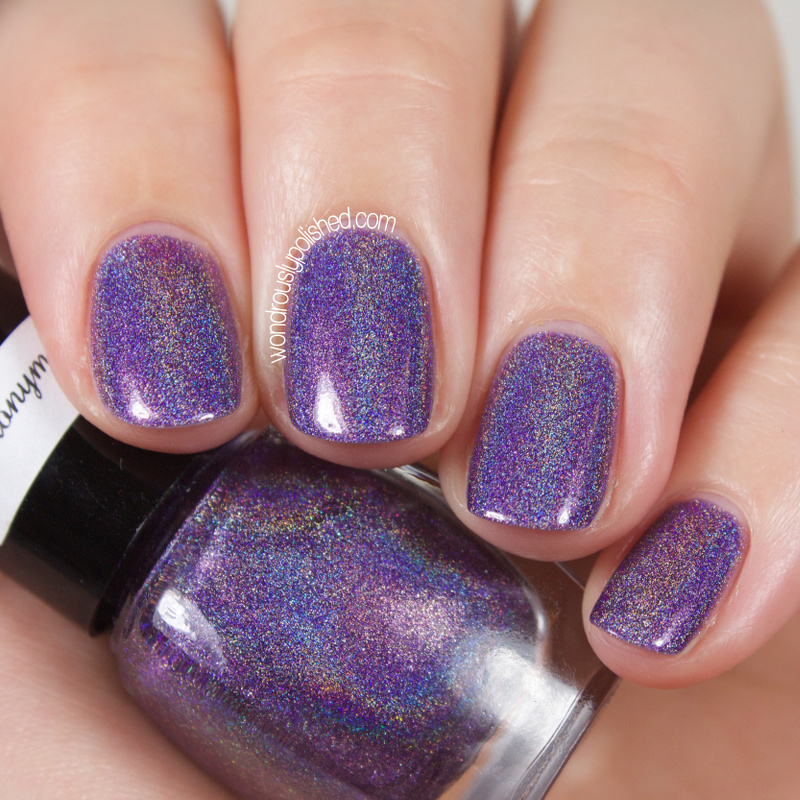 It's a mellow purple linear holo and this is probably my favorite of the collection. It's subtle but still interesting. Shown is 3 coats, but this is a buildable polish and you could get away with fewer coats if you wanted. This is on the thicker side, but it is still very manageable to work with. 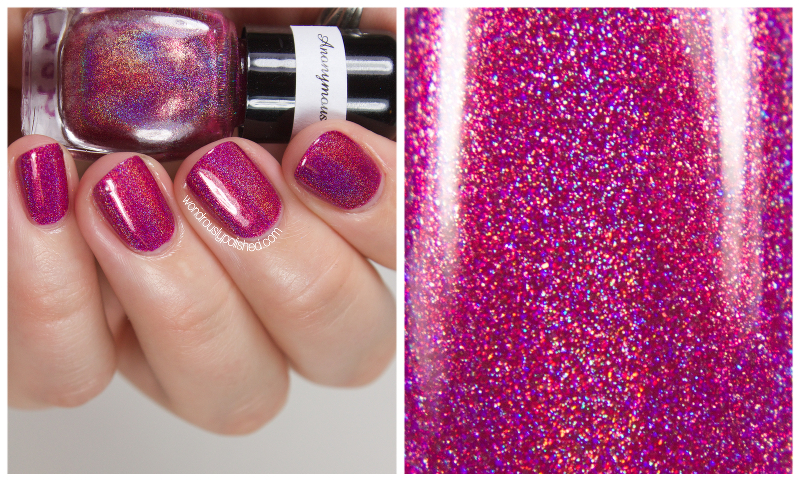 Inspired by a Steely Dan song, RBWMY is a magenta holo that is in honor of Mill's friend's mother who recently passed. 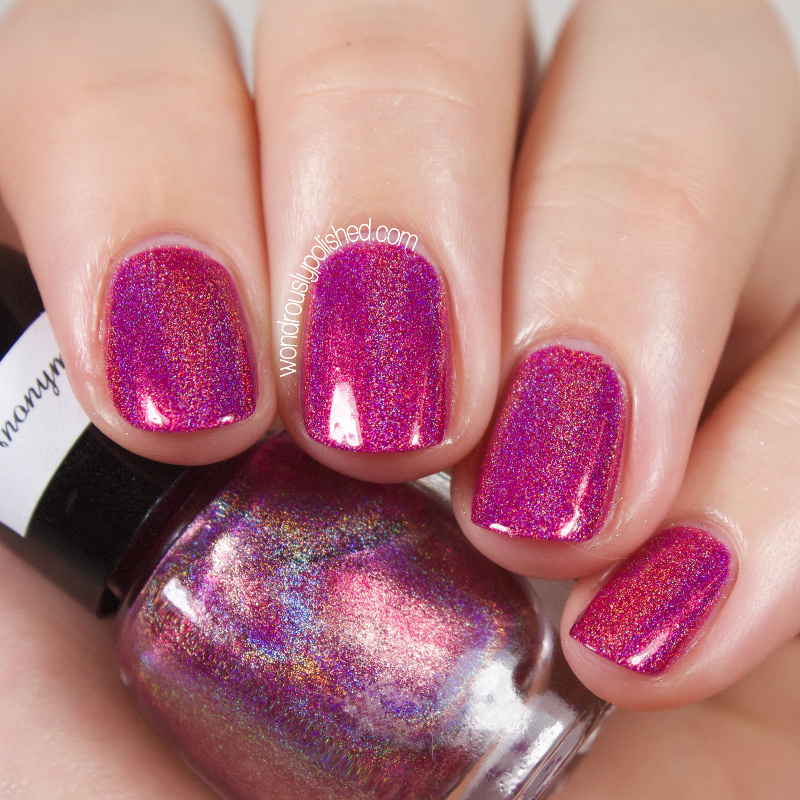 It's a 2-3 coater holo and is really lovely. While it's name includes "ruby", I'd say this errs much more on the side of pink than red. Still a great shade regardless, and if you like your dark pinks, this is definitely a good one to add to your collection. This is a unique glitter topper that I can't say I've seen a dupe of anywhere. It's packed full of pink, lavender, green and blue pastel small hex glitter as well as a mix of larger black shard glitter. 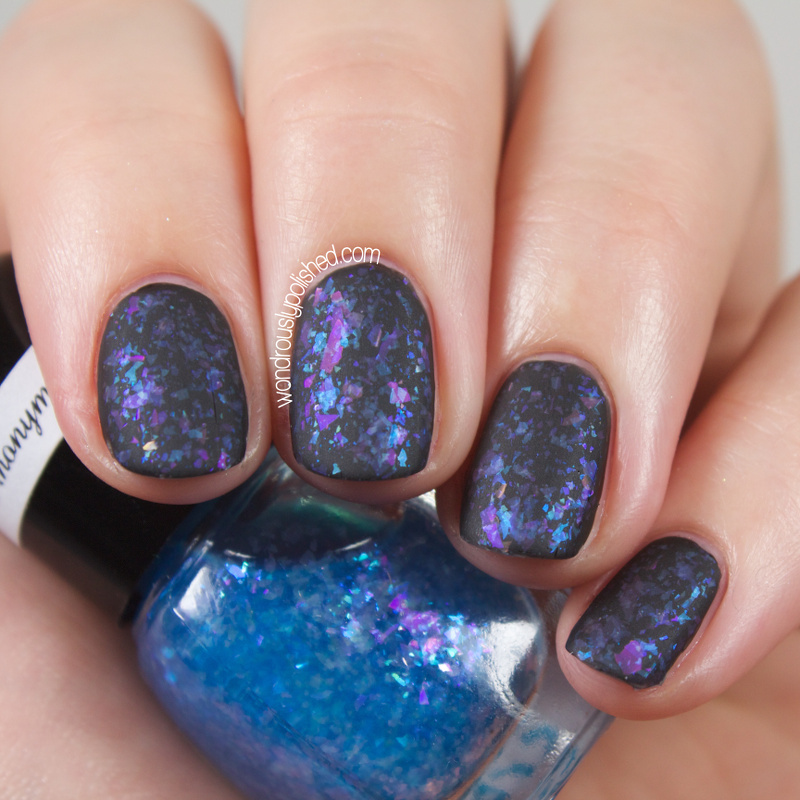 There are also a few iridescent star and circle glitters that add a little more interest to this polish. It's an intriguing take on the pastel trend of this year. Shown is 1 coat over Zoya's Chantal. Inspired by a Brian Adams song, Torun is a blue and purple iridescent flakie that I was pretty unimpressed with when I first put it on with a top coat. 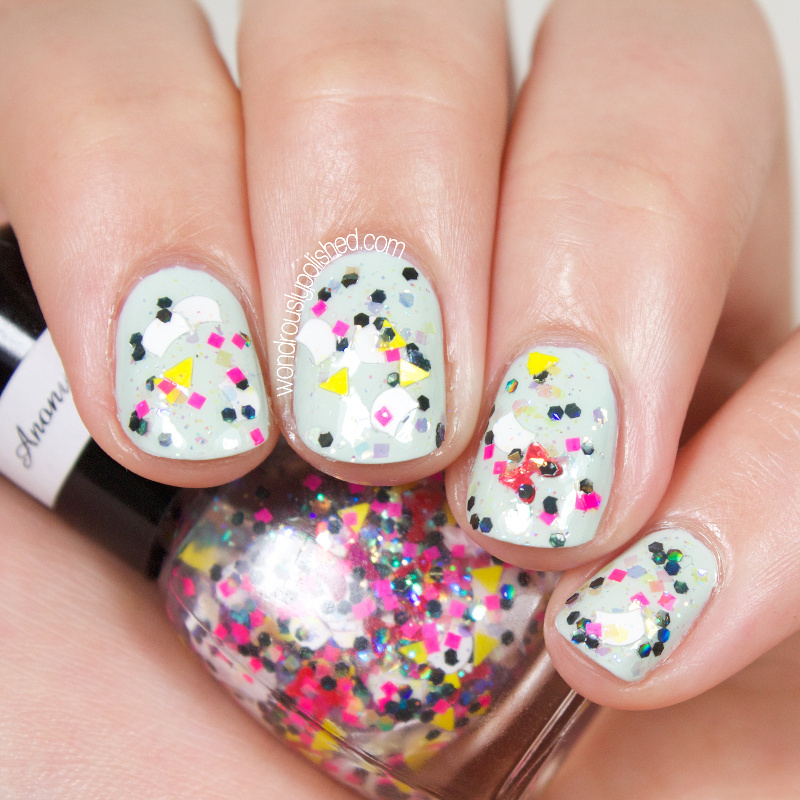 That being said, once you add a matte top coat you'll be drooling over this one. The matte finish really shows off this flakie and I'd say it's a must with this polish. The formula was nice, very smooth application and very easy to get out of the bottle. Shown is 2 coats over Zoya's Black Swan. This is the bonus polish I had mentioned that is in honor of Hello Kitty's 40th anniversary. It's a glitter topper with little white hello kitty heads, pinks bows and random yellow, pink and black glitter. I've never been much of a Hello Kitty fan, but I think this is a fun polish that HK lovers might enjoy :) There was the tiniest bit of glitter placement for the larger glitters, but overall, the formula was easy enough to work with. Shown is 1-2 coats over China Glaze's Re-Fresh Mint. Currently, there is a naming contest happening on Anonymous Lacquer's Instagram page, so be sure to check out how you can enter to win a bottle of this. Overall, I think this is a really strong first collection. The formula's were all very nice and manageable, and the colors were all very appealing. I think there's something in this collection for everyone, and I'll be curious to see what else Mill comes up with. 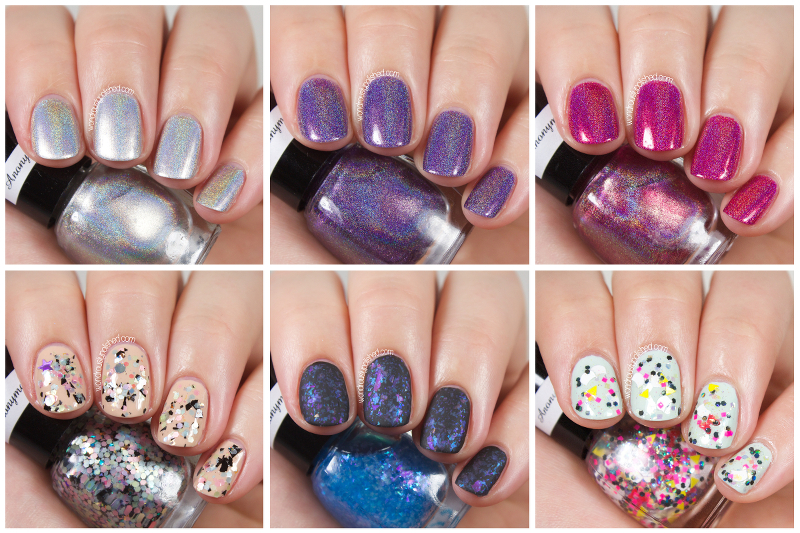 I think my favorites from this are the Holos, especially Purple Rain-bows. 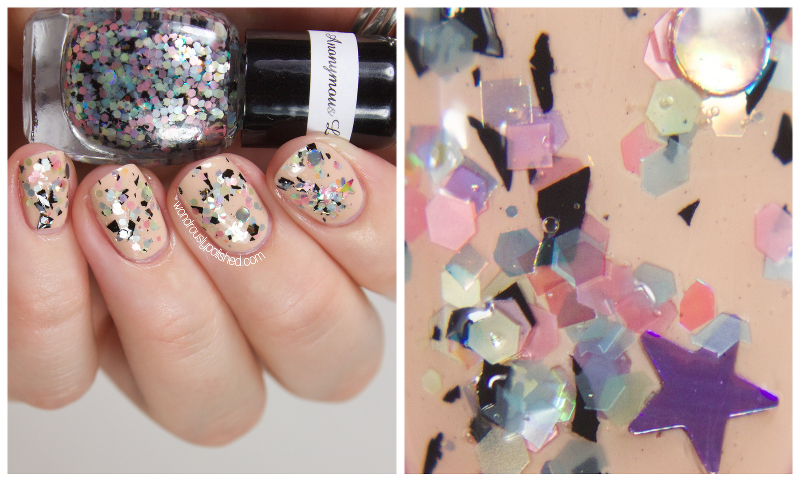 You can purchase the collection from Anonymous Lacquer's Storenvy page for $10/full size bottle and $6/mini bottle. 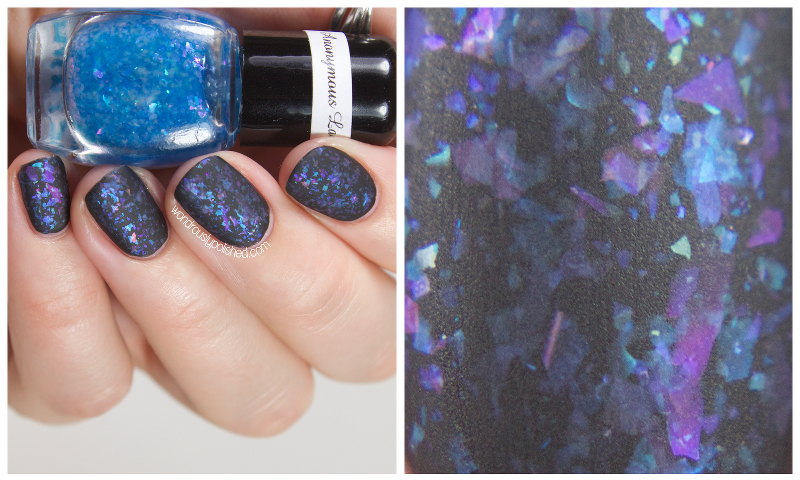 Be sure to follow Anonymous Lacquer on Instagram and Facebook to keep up to date with collections and promos. What do you think of this collection? Which 80's icons would you have been inspired by? Happy Polishing!